The IPR-10G-HDMI is a SMPTE ST 2110 to HDMI converter, with two 10 GigE ports to support hitless switching. Suited for point-of-use applications including HD source monitoring, digital signage and video walls, the IPR-10G-HDMI decodes SMPTE ST 2110 streams and then formats the data for output on a full-size HDMI 1.4 interface. The audio associated with the video stream is extracted, synchronized, and then embedded into the HDMI signal as well as output on an analog RCA audio interface. 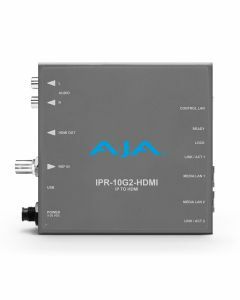 AJA IP Mini-Converters are designed for point of use applications for the encoding, transport, reception, and decoding of IP based video sources. Rugged, compact and fanless, these practical Mini-Converters provide the bridge between baseband and IP video for a range of applications.